That was a pretty solid piece of entertainment, no matter which way you slice it. Emotion, drama, tension, thrilling action, this week’s Boruto episode was so good that it actually felt like a Naruto Shippuden episode, which isn’t surprising because the current ongoing arc is actually based off a Naruto story (The Naruto Gaiden arc). What’s noteworthy about this week’s episode, beyond the fact that it was splendidly good, was the fact that it was the first time since the whole Naruto Gaiden story arc started, that we’ve actually seen a nice mesh between the worlds of Naruto and Boruto. 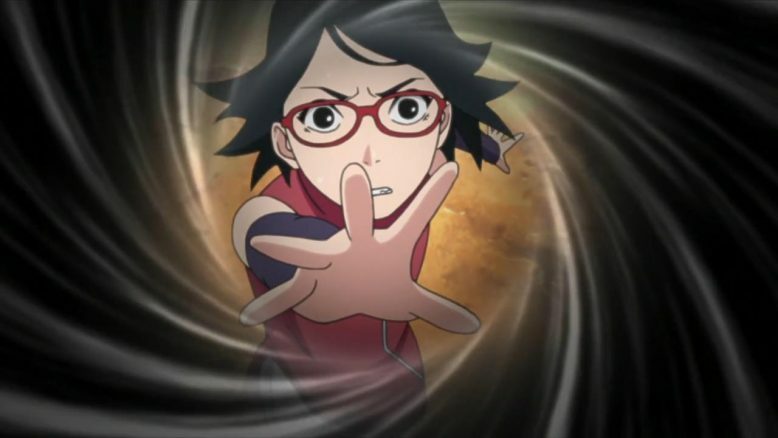 There was just the right amount of humor, the right amount of family, and with Sarada and Chocho being around Naruto, Sasuke and eventually Sakura, the show very much felt like it hand one foot in the past, and one in the future. 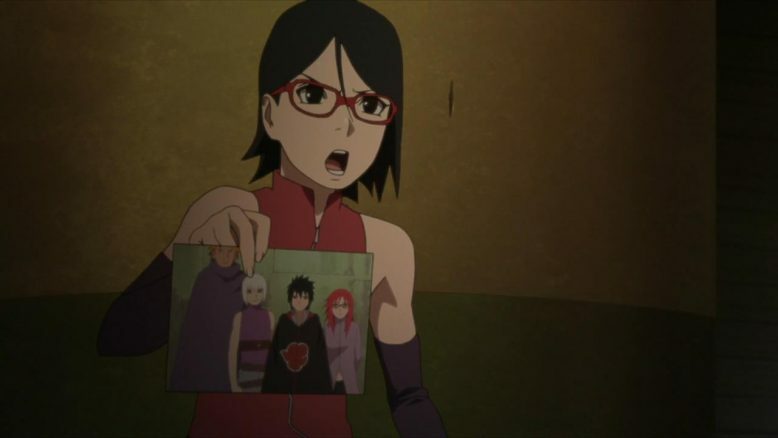 The show still seems to be heavily hinting that Sarada’s mother is actually Karin, and not Sakura, but if this week’s events showed us one thing, its that both Sakura and Sasuke are very much Sarada’s parents. I’m not sure who the real mother is in this situation, but the fact is that for once, based on Sakura’s actions, it really doesn’t matter. If anything, what this week really kinda argues is the idea of whether Sasuke and Sakura are really suited to be parents, given their unique life situation. 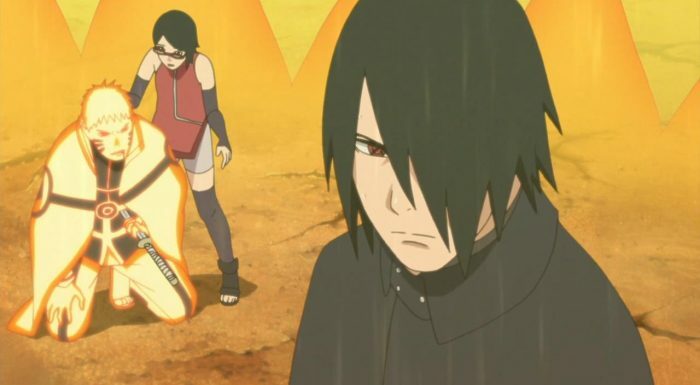 I’m not sure if Sarada was an accident, or an intended child, but you really have to wonder what Sasuke and Sakura were thinking when they had a child and then still decided to move on with their lives as is. When a child comes into the world, generally the priorities of the parents change, and their world revolves around their child, for the most part. Unlike say Naruto, however, it doesn’t feel like Sasuke has the same excuse that the Seventh Hokage of the Konoha village does for neglecting his child. Sarada isn’t as demanding or needy as Boruto, and simply saying hi to her every now and then would have probably been enough for her. 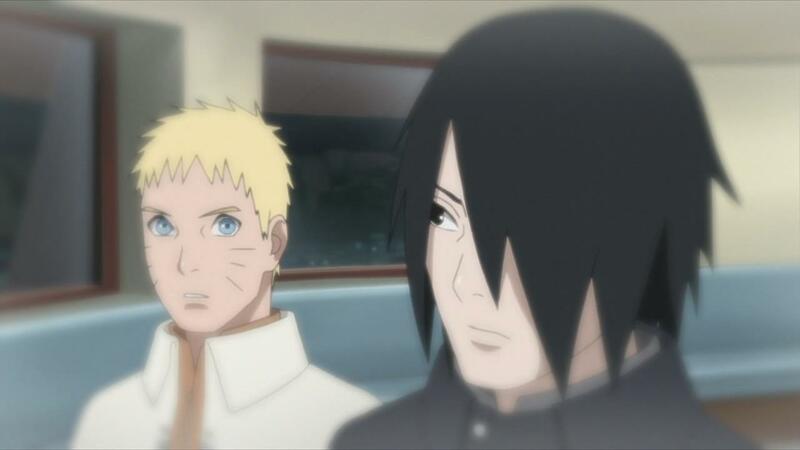 And look, I get that Sasuke has a unique power and that he’s trying to maintain the peace that he and his friends created, by keeping to the shadows, I get that. The problem is that there is a way to balance being a hero, and having a small amount of time to dedicate to your child. Sakura for her part, definitely cares about Sarada, but just doesn’t know how to deal with some of her problems, especially when they relate to her father and family. Family is a big deal, and for children, its a big part of their personality and their confidence in growing up. It just hurts me, I guess, to see Sakura and Sasuke take for granted the fact that they have a daughter, and not go the extra mile for her. 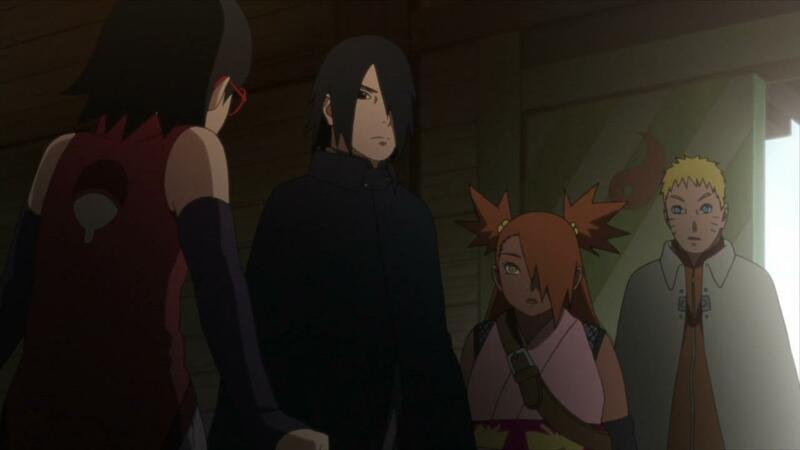 This one frame shows the entire relationship of the Uchiha family in a nutshell. Maybe part of it just the fact that I actually want Sarada to be happy. I’ll be honest, in the original Naruto story, I was never a huge fan of Sakura and Sasuke. Both characters kinda irked me, in how much they screwed up and how they basically were still able to become good and happy because of Naruto and the fact that he was and is the way he is. It wasn’t lost on me, therefore, that we got an episode where Sakura, Naruto and Sasuke were all fighting together, after what seems like an eternity. But Naruto very much feels like a side character in this story, because it really is about Sarada and her parents. To that end, I have to say, I really enjoyed the interaction between Sasuke and his daughter, as heart wrenching as it was. Sasuke’s the sort of odd character that really shouldn’t be forgiven, if I’m being completely. 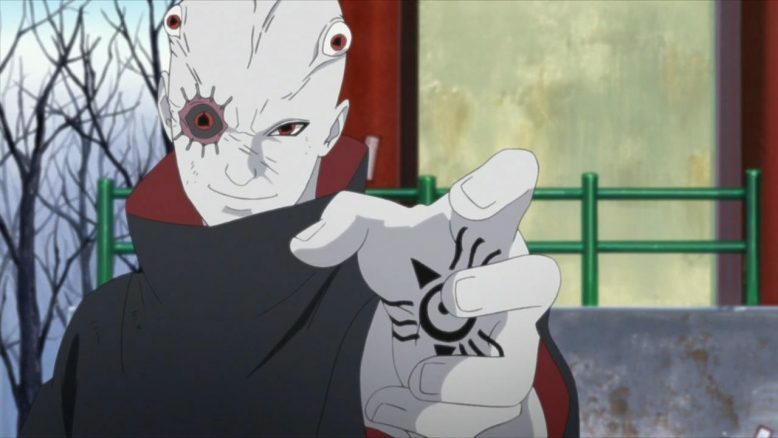 Sure, he ends up rallying to the good guy’s side near the end of the Third Shinobi war, but this is a guy who fought to destroy Konoha for a good many years. And I do like the fact that, as much as both Sasuke and Naruto dance around it, they both understand the real reason Sasuke keeps himself away from home. Sasuke actually doesn’t feel like he deserves to have a normal life, after all that he did. So the only thing he thinks he can do, is protect Konoha from the shadows. There is another way towards redemption though, and that’s obviously in raising the next generation. But, before Sasuke resolves his family issues, he’s got a “Shin Uchiha” horde to deal with. It seems that not only are there multiple white kids with Sharingan, but that they’re all basically called the same thing. I will continue to echo that I’m not a huge fan of whatever Akatasuki left over we’re getting as a villain here. Sure, this new guy is powerful enough to surprise Naruto and Sasuke, but honestly, I really don’t care about this villain. We’ve had some great villains in Naruto’s stories, from Pain to Itachi… Heck even Toneri was a much more interesting villain than what we have here. Of course, Shin really is just a reason to put one of Sarada’s parents in danger, and in this case, it ends up being Sakura herself. Yes, I admit that I really liked both Sakura and Sasuke acting like real parents and basically putting themselves in harms way for their daughter, multiple times in this episode. I’m not entirely sure where the story can really go from here though, and this may very well have been the peak for the Naruto Gaiden story arc. 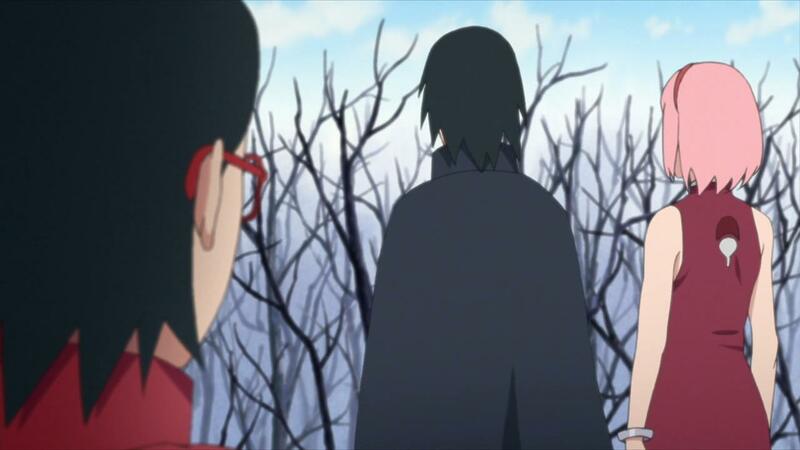 All that’s left is to defeat the bad guy, and then for Sasuke, Sakura and Sarada to have a nice long family chat, and solve their issues. I suppose I’d be a lot more curious if I hadn’t seen the Boruto movie, and seen the eventual result of whatever happens in this arc. So there’s no real unknowns here, and what this arc really has then, is just the journey. Sarada’s family is just a bit out of reach. Just a bit. The journey so far, has been rough, with only this week’s episode really being a stand out. We’ve still got a bit more to go, so it’ll be interesting to see how this arc turns out, overall, once everything is said and done.